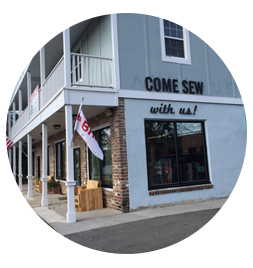 It always amazes us how many of our customers actually own a serger, but never really use it. Sure, they can be a little daunting with the blades and all that threading, but sergers are really a great investment for any sewer, espeically the ones who like to use special techniques like ruffles, piping, lace, and such. That's right. Serging isn't just for finishing your seams. Don't get me wrong, it is great for that. It gives your clothes a great finished edge and makes sealing the raw edges stupid simple. But, sergers are great for so many other things, too. A serged seam with four threads. If you're only using your serger to finish your seams, you're really missing out. Our serging classes and the serger in the store are all using the Brother 1034D. We love this machine because it's affordable (on sale now at Amazon.com for $190!) and portable, mostly. But, also because it's easy to use. No matter what brand of serger you buy though, get one with 4-threads. These are much more versatile and allow you to do more with your machine. In class, we discussed machine basics like using your blade (or not), changing needles, threading, using two needles, and thread tension. These are all tools that you can use to make your machine work better for you and get perfection out of your projects. It is important to remember that sergers (especially the threads) are very tempramental. Even the slightest change can make the biggest difference. In class, the students learned quickly that serging, like sewing, is going to take lots of practice. We always recommend the book Successful Serging by Beth Baumgartel for our customers. It's a great go-to guide for getting to know your machine as well as a quick reference for more advanced projects. Serged rosettes, anyone? Our first task was a rolled hem. This finish doesn't use a special foot, but does require you to remove the finger which is located under the blade. Scrap serged with a rolled hem on both sides. It's not our favorite for clothes, but it is nice for napkins and to finish specialty items like holiday stuff. Consider buying specialty thread like silver to give them a fancier edging, but be sure to ask if it can be ironed before using it. Don't want your thread to melt, or worse, for you iron to get ruined. There is a rolled hem foot for your sewing machine but it only turns under the fabric. It doesn't actually finish the raw edge like the serger does, but if you're in a hurry and don't mind the rough look to it, give the rolled him a try on your next pattern. Next, we practiced gathering with the serger. It's really simple to do and works best when you add the second needle. All of the gathers are perfectly even and they look very professional, but it's important to note that it's hard to change the length of the gather. If you're trying to gather for a waist hem, for example, you should probably do it on your sewing machine so you can adjust the gathers to fit the exact measurement of your waist. Ruffle (dots) serged to main piece (elephant). Everyone in class loved how simple it was to do this and were impressed with how professional the gathers looked. But, like with anything with serging, it can be finicky. We all agreed that it will be so worth it when you get it down. Lastly, we attached a piping foot (not provided with your machine) to see how much easier it is to pipe with your serger than with your sewing machine. It gets the fabric really close to the piping and it also finishes the interior of the seam with a serge. Too cool, right? The foot can be a little pricey, but after trying it out everyone agreed it was worth it especially for larger projects like pillows. So, if you have a serger, grab your user manual and/or Successful Serging and go for it. We will host more serging classes in 2013 after a whole new slew of eager serger owners (from Christmas) look for advice. Brooke is available for private lessons between now and then if you just can't wait. Just call the store for details.